took a break from working on the bottom and did some topsides stuff. Polish with Prism Polish. Super stuff. Cleans the hull beautifully. The real trick is to finish it with their product: Mirage Sealant and Protectant. Based on last year's experience, we will use at least two coats, maybe more. 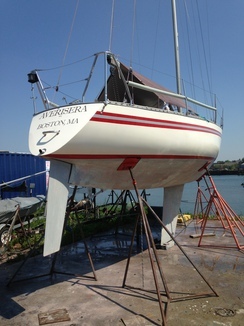 Our old gelcoat is fairly porous at this stage, thirty years after construction. Details to follow. Polish is on. Next step is to wipe clean again and apply several coats of Mirage finish. 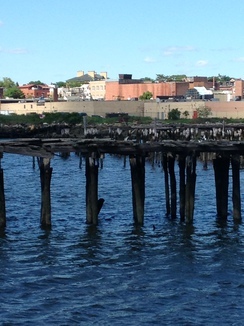 Terns are nesting in the old pier. It is fun to see them all lift off from their nests, fish, and return to nests. On the Cape, tern nesting areas are all off limits. Here in the big city, nesting terns are adjacent to the boat. Urban sailing has its benefits. 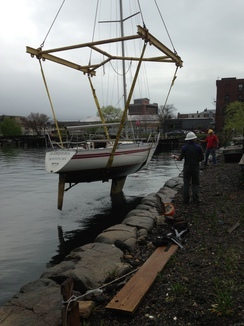 Our berth at the Piers Park mooring field is unavailable for a little while. 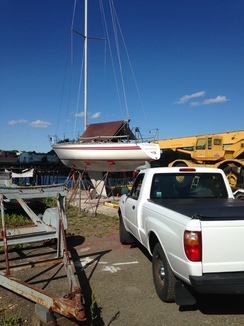 So, we have hauled Averisera at the Boston Sailing Center boat yard. 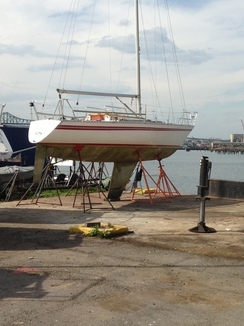 We are wet sanding the bottom and letting the boat dry out a bit before repainting and launching in late June. After a good wash, thanks, Will. Averisera needed a bath! During the winter, I scrubbed the bottom about once a month. This is growth of about a month since the last brushing. Not bad. The brush can't quite get all of the bottom. 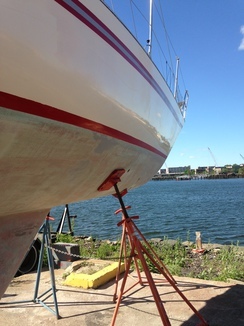 Notice those old fashioned slack bilges. After working away on the underbody for about 15 hours with sanding blocks it is about ready for a coat of anti fouling. We think Petitte Vivid White will do this season. Imagine doing the bottom of the tanker in the distance? 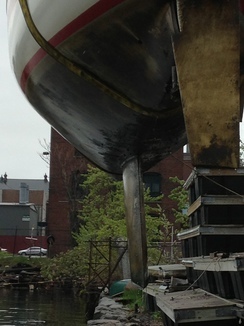 I think that the epoxy based anti fouling from Copper Coat is the next big expense. It requires soda blasting, fairing, and then the coating. The advantage is, haul to wipe clean and burnish but not to repaint. Actually, the entire thing can be done in the water, no hauling required. 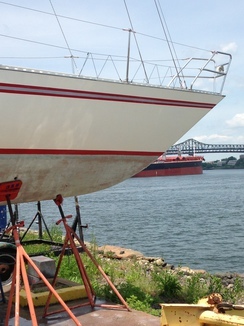 Ironically, the Copper Coat gallery shows a small Wavelength 24 race boat converted from Vivid White to Copper Coat. Jim at CooperCoat has been very helpful. We may not need soda blasting!